The Bhopal Gas Tragedy claimed thousands of lives as a result of leakage of lethal gases from a pesticide plant in India. 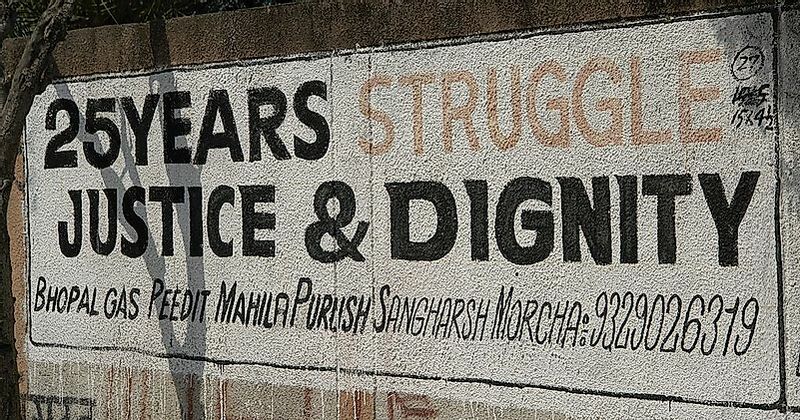 A wall art in India demanding justice for the victims of the Bhopal Gas Tragedy. Industries are considered to be the key to the growth and development of the human civilization. Since the industrial revolution came into action, the world has seen an immense growth in the human living standard. With every good thing, there are definitely things that can cause harm. Despite all precautions and safety measures adopted, there are probable chances of industrial disasters, which can cause severe damage to life and property. The most basic reasons for these disasters are mistakes, irresponsibility, negligence, and lack of proper safety measures. Since centuries, some disasters have drastically changed the lives of people who were victims of the disasters. The Bhopal Gas Tragedy to Minamata disease or Benxihu Colliery Explosion, all these tragedies had a huge negative impact on the lives of people for generations. In the human history, the three most hazardous industrial disasters which had an immense impact on people are the Bhopal Gas Tragedy, Minamata Disease, and Benxihu Colliery Explosion. On the night of December 03, 1984, a hazardous gas methyl isocyanate leaked out through a chamber at Union Carbide India Limited in Bhopal. Over 5,00,000 people were exposed to this gas and suffered terribly from this toxic gas poisoning. Nearly 8,000 people died after two weeks of exposure. The gas temporarily affected 38,000 people and permanently affected 4,000 people. Official data had some controversy with other institutes over statistics of death tolls and injuries, but the incident proved to be the deadliest incident around the world. Minamata disease was caused due to the flow of the highly toxic methyl mercury as wastewater from the Chisso Corporation's chemical factory into the water bodies near Minamata city in Japan. The toxic substance bioaccumulated in the body of shellfish and other fish in the Minamata Bay, which when consumed by the people, animals, and birds caused severe illnesses and death till 36 years of the incident. The flow of the contaminated water continued from 1932-1968, which affected the people and surrounding lives for a span of 40-50 years. The official record recognizes only 2265 victims who were paid compensation. Benxihu Colliery Explosion was an incident that took place on April 26, 1942, in China where a mine was set on fire because of gas and coal-dust explosion. The incident took nearly 1549 lives because of mistakes committed by the Japanese army. The main cause of death was carbon monoxide poisoning, which accumulated in a closed place and caused suffocation. The incidents shook everyone with their huge impact on all the living beings around. It forced the world to stop and think about important measures that are needed to be taken before setting up industries that manufacture hazardous and toxic substances. Before setting up these types of industries, it is important to make sure that the surroundings are safe. The loss of lives and injuries from these incidents were so severe that some effects can still be seen in the young generations of the affected victims. After these incidents, tougher laws were made, laws related to the control and safety of the industrial sites were passed so that in the case of any accident, there would be minimum loss.